Knowing when a device is sending data or inactive can be valuable to malfunction possibilities in your IoT infrastructure, connection errors, or low battery. With Ubidots you can create an alert when a device or data source is inactive alerting your immediately to a possible impending outage. 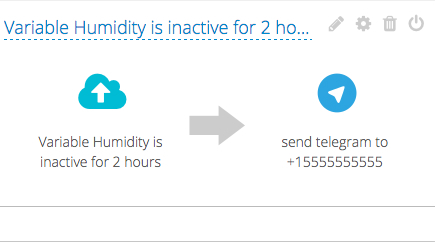 To create this alert based on inactivity, tell Ubidots which variable you want to trigger when inactive and for how long should a device be inactive before it is a possible malfunction. Our example shows two hours. Next, choose the format of your alert. In this case, we will use a Telegram. Enter the appropriate receiving phone number and custom message. Pro Tip: you can insert the last variable of the variable you're working with by following this tutorial.